Corporate Learning & Potty Training! I can hear you thinking – what on earth has potty training got to do with how we train our people? I came up with this metaphor during a recent gathering of our Global Academy Team during a discussion on how to better meet the needs of our users. Here are some questions to think about when you are helping your kids in this important task! Where is the most likely place they will be needing the training the most? – The answer to this is obvious to me – they need this training “on the job”! When will they be needing it? – Their need is never going to be set in their calendar and I suspect many a parent wishes they had a crystal ball in those early days of training. Also, “just in time” rather than “just too late”! How often will they need reminders? – This training needs to be on demand and in the early stages, they will most likely need a lot of reminders! Whilst this is very much “tongue in cheek”, there is much to be learned from this metaphor which can be summed up as “take the learner to the learning, not the learner to the LMS”. Check out my earlier blog on “The Invisible LMS” for my thoughts on how to achieve that. On your Intranet – if you are very lucky! 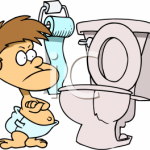 As with Potty training, the user experience for our own learners is a vital element of our Learning delivery that we overlook at our peril. Unless you want to spend a lot of time cleaning up the mess after a training need hadn’t been met!